California Mid State Fair started July 19th. 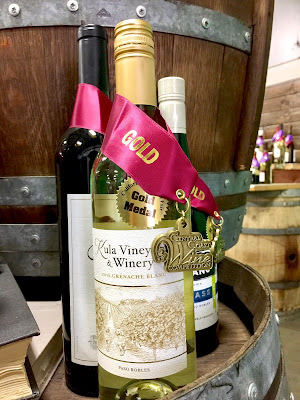 One of the things my husband and I are looking forward to seeing was our Grenache Blanc with the gold medal at the exhibition room. Today, we went to the fair, and had a very happy moment. Mommy: "I found it, darling! Our Grenache Blanc is right here!" Daddy: "Oh, my goodness. It's sitting beautifully with it's gold medal. I'm very happy to see it." Mommy: "Thank you for staying at home nicely today. Let's give you some biscuits." Kona: "Please come to my mouth, biscuits." 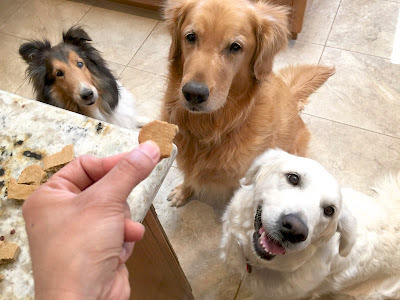 For mommy & daddy who are very happy to know that our first vintage was highly rated by judges at the big contest, please click the puppy photo on the right above or a dog picture below to vote for a doggie blog ranking. Thank you!